Ralphs Grocery Stores www.ralphs.com is the largest subsidiary of the Kroger Company and is the major supermarket chain in Southern California. There are 304 Ralph outlets statewide with 1200 new employees hired in 2014 alone. If you have a problem with service or product at Ralphs you may call 1-800-576-4377. You may also find contact information here. Customer comments are welcomed on this web page. If you want to contact Ralphs CEO Donna Giordano by postal mail address your letter: 1100 W. Artesia Blvd., Compton, CA 90220. The Compton headquarters phone number is 310-884-9000. Ralphs is an iconic grocery store in Southern California and has showed up in recent Hollywood movies. Started in 1873 by George Albert Ralph it is the oldest grocery chain west of the Mississippi River. Ralphs pioneered self check-out. Ansel Adams photographed the 1929 building housing Ralphs. The same building is on the National Registry of Historic Places. Social presence may be found on Facebook, Pinterest, Instagram and Twitter. I go into the Weyburn Westwood Ralphs location quite frequently and am so sick of the homeless problem inside the store. I watch them stick their hands in food in open areas, open closed packages and even hear them screaming throughout the store. I have on numerous occasions personally tell the manager, nothing is ever done, they allow it. I have also contacted corporate in the past, obviously nothing has been done. My next step will be to contact the Health Department and report this as a major heath concern as the homeless bring their germs and whatever is in their bags (bugs, disease, rodents) into the store. This is absolutely disgusting. After purchasing my groceries (basket full), which were all bagged Ralphs bags (10 cents each), I walked to my car. As I reached my car, an employee called out to me; at the time I didn’t know I was being followed. The employee asked “Did you through the checkout line?” I turned and looked at the employee who then said “never mind”. I then put my groceries in the car but it bothered me quite a bit. I returned to the store and found the employee (calcausion, young, black hair). His name tag indicated that he was a Front line manager; I don’t recall the name. I said to him that he questioned if I purchased my groceries so please review my receipt. He said that he didn’t know why I felt I needed to come back. I said since you questioned my purchase, please review my receipt. He said once he saw my expression, it seemed genuine so he let it go. I told him that I did not appreciate being followed to my car and questioned. He said, “let’s not pretend this doesn’t happen everyday at Walmart”. I told him I wasn’t shopping at Walmart. My compliant is this: I was treated very rudely and feel that I was racially profiled since I was probably the only African American shopping at the store at the time. I’ve shopped at Ralphs for over 20 years and have never been treated so rudely. For one thing, he never apologized and made things worse with his comments. I can not believe that Ralphs would have managers that treat customers so rudely. He was unprofessional and very negative. It is the customers that provide the income for the employees including managers. It is the customers that allow the store to remain open. I want this employee to provide a written apology to me and I want Ralphs to compensate me in some way for my experience. I am so disturbed my this experience that I find it very difficult to shop at the particular Ralphs. I feel very uncomfortable shopping there even though this Ralphs is very close to my home. I’m still appalled and upset and this incident occurred on 12/30/2018. Have been a long time Ralph's customer. Have always been pretty much impressed with service and quality. However, today I was shocked and embarrassed by what happened to me when I exited the store. My wheels were locked as soon as I passed the doors. I thought I had run over a foreign object. I tried to check the wheels when I saw an employee put up her index finger as if to say...wait. She went inside the store and got a device that she pointed to my cart. I asked what I had done wrong. She did not answer. The first try to unlock the wheels was unsuccessful. She had to backup into the store and try again. It unlocked the wheels and I went on my way. However, the incident caused quite a scene and I was thoroughly mortified. I know that this is an anti-theft device. Everyone else knew it too. I will never be back to this store. I feel like a criminal. My rewards card # is 477047332089. The store location is Saticoy and Louise in van Nuys. I am filing a complaint about the Ralphs at 5225 Canyon Crest Dr, Riverside CA 92507. The Cashier Sal A. was very rude and impolite to the customers and made a terrible experience. I went to the cashier desk and said "How are you doing?" to Sal, he pretended he did not hear it and ignored me. After asking me whether I have a Palphs rewards card, I said "Yes sir" and handed my key chain to him for scanning. After he is done, he rudely threw my key chain to the corner of the table and I had no way to reach it. In the meantime, he was just talking with another cashier and laughing. It was the other customer behind me who helped me grabbed my key chain and returned it to me. This cashier Sal made me very angry and unpleasant. What's even worse was that after I noticed that he forgot to put the green bags points to my rewards account, I went back to him and politely asked whether he could help fix this. He then turned around and started to grab COINS from the cashier machine and said "it will just save you five dimes, here you go...". I was standing there and felt being humiliated. Is this what Ralphs call Customer Service when an employee treat their customer as beggar? Is this what Ralphs call Customer Satisfaction when the customer feel seriously offended and humiliated? I really hope Ralphs or Kroger can take action to prevent this from happening. 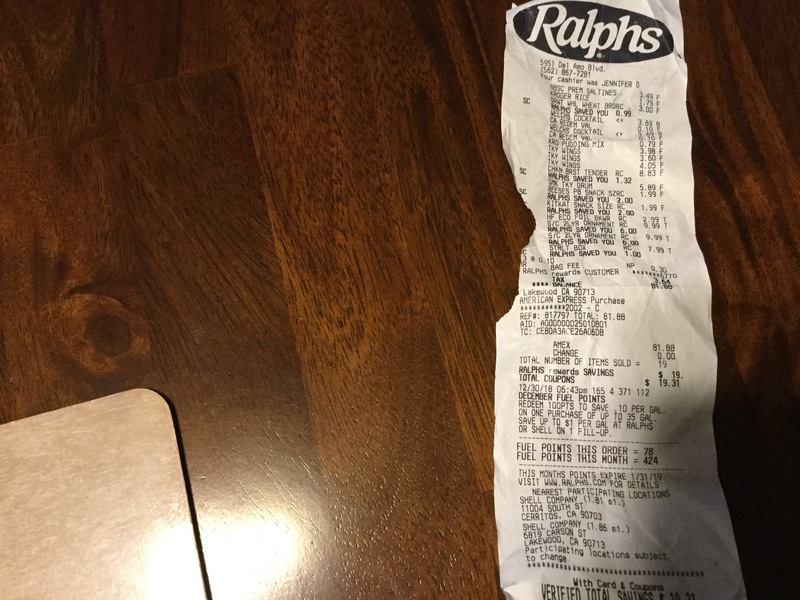 That cashier Sal A. working at Ralphs, located at 5225 Canyon Crest Dr, Riverside CA, is ruining the customer experience as well as the reputation of Ralphs and Kroger company. Ralphs on 14440 Burbank Blvd is dirty. Trash is all round the parking lot area. Main entrance trashcan is always overflowing. It is attracting homeless people. 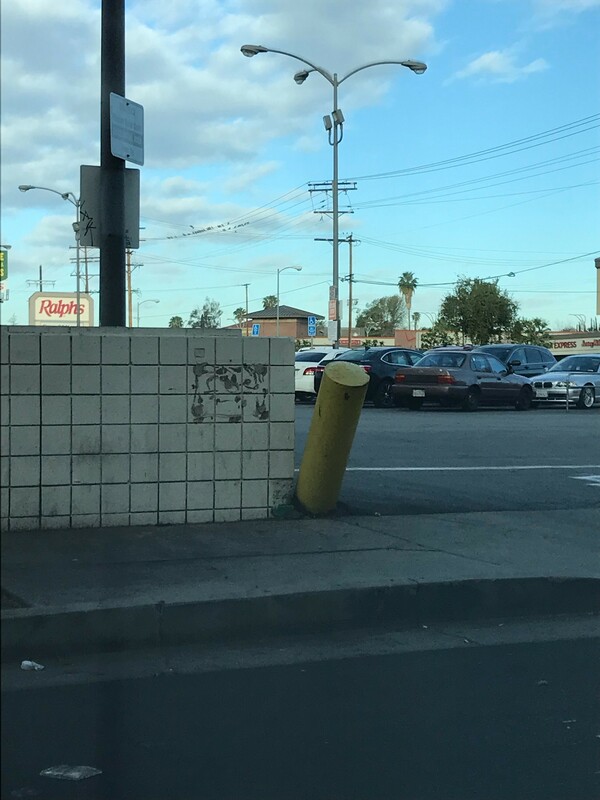 A big yellow pillar by the parking entrance way on Sylmar is about to fall for the best several months and still not fixed. It is a public health hazard. On Thursday October 11, 2018 my wife purchased a container of broccoli salad from the deli section of the Ralphs Supermarket located in Castaic, Ca. on The Old Road. We ate approx. 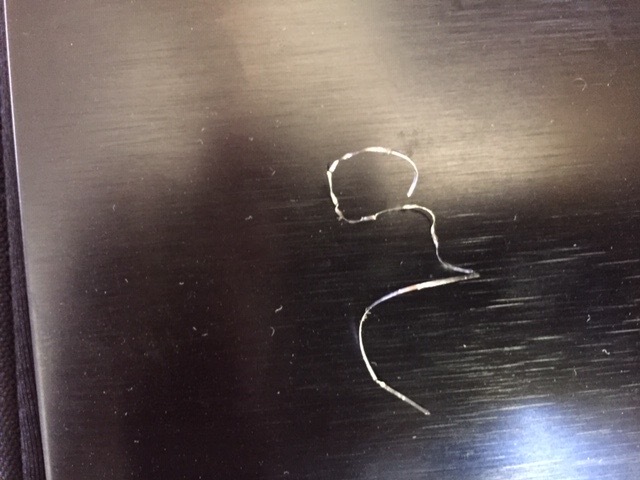 one half of the contents when my wife found a curled piece of metal in the salad. This piece of metal would be approx. 3 long if straightened out. The metal was curled as if it had been lathed off of a larger piece of metal. The ends are sharp. Fortunately no family member ingested this metal. ( I should say so far as we know nobody ingested any metal.) If they had ingested it the potential for a serious medical problem would be great. A sharp piece of metal such as this could easily puncture the intestine, or because of its curly nature could easily entangle itself in, and around, tissue within the digestive tract. I do not believe this type of incident with its potential to harm one of your customers can be remedied by merely offering a refund or giving me a new container of broccoli salad. I look forward to hearing back from you detailing how this situation can be remedied to our mutual satisfaction. If I do not hear back from Ralphs in timely manner I will have no other choice but seek legal advice. I have attached two photographs to help clarify my complaint. You state if you buy 6 bottles of wine you get 30 % of the bottle I have always purchased your wine now you have change it is only on the ones that you say are the 30 % off but your sign on the wine says 30 % off but you do not give it on that wine then why does the wine show 30 % off if you buy 6 bottles mix and mach I brought it to to the attention of the manager on duty and I got thats the way it is .If you need a receipt I will be glad to send it to you. Now because of this I will no longer shop at Ralphs there is a Vons and Albertson close by and they will get my business. I have always shopped your stores no longer. My Ralphs # is 4 77020 711146 you can track my purchases It's to bad you have made a change in your policy. I will no longer refer your stores to my friends.The store is at 1020 university ave. San Diego Ca. I had to call the Ralphs Customer Service today regarding a double charge that occurred last week. The employee named Chris ID Nr. SPH7660 was very unfriendly and unsupportive throughout the entire call. She started giving me attitude about my statements to the point of being rude. The call ended by her hanging up the phone because she simply didn't want to talk to me any more. This was the worst service I experienced in the last 10 years of being a Ralphs customer and will influence my decision being a loyal future customer of the store. This treatment reflects very poorly upon the store. I hope they will find more qualified employees in the future. POOR SERVICE! Yes I agree most of Ralph's employees are miserable scum. But Ralph's needs these donkeys to make more money so they will cover up for them. One of Ralph's biggest secrets is the avalos family who all work there they all do witchcraft or involved in stalking activities and harass fellow employees. Ralph's will one day pay. 80% of Ralph's is fraud. Ralphs Westwood store in LA, CA has some rude, disrespectful checkers and sometimes sells rotten foods too. Ralphs store is huge, expensive, spacious and has had policy of all employees always greeting all customers - good idea. But also last few months they sold me rotten mangoes, green toxic chicken livers, leaking bloody-water chicken in plastic bag that soiled car seat and has some very rude, disrespectful checkers too. Managers are mostly courteous, listen. Some checkers are OK. A few are arrogant and loud back-talking while thinking they "own" the store and can act so. Written complaints being sent directly to them and elsewhere reviewed also. I made a purchase at Ralph's 950 N LaBrea, after using my debit card the cashier stated denied, did it again she stated denied. I watched the terminal and it stated processing so I use my visa as another form of payment called my bank and the purchase for 64.00 went through on my debit card and also on my visa. I called the store asked for the manager he accussed me of pulling my card out to soon I told him my receipt shows payment twice and I will return he hung up in my face. Returned to the store and the cashier and the manager both ignored me until I asked if I could talk to him, he told me your bank will resolve the problem, the cashier continued to leave her register and walk between us mumbling. They were rude and disrespectful to me, did not investigate the issue and blew me off, I have evidence of payment being made twice! I filed a claim with my bank to get my money back. I will never step foot in that Ralph's again after the way I was treated! Document will be submitted upon request. I know the cashiers drawer was over by 64.00 or more depending on how many other people she messed over. The cashier and the manager seemed to be partners in crime so they probably found a way to balance her drawer. I would like to be contacted about this incident. This has inconvenience me and also disrespected me and all I did was to shop in Ralph's or any other related place of business. Short story I worked at Ralph's 81 from 2008-2014 tried to go back. The store won't hire me part time but I wanted to take summer months off for more kitchen and resort experience. At the other store 70 one of the produce men, not very polite at all. I shop allot for my mom and family, saying hello, slap in the face. I would appreciate some kind of gift card we shop 3 times a week. I waited in line forever as there were no enough registers open. I finally get my turn and package my own groceries since there is no one to help to bag them and there is a lo9ng line behind me. I write a check as I always die at that store. The tell me I need another form of ID. I tell the cashier that it is in the car and that I have never been asked for it before and that is why I didn't bring it in with me. She just stands there with a blank look on her face, so I ask to see the manager. I can't hold all the people in the line up while I go to the car to get my ID. He was so rude. Didn't say I'm sorry but we can't take you check with out an 2nd ID or use any kind of diplomacy. He probably doesn't know what the work means. The best supermarket would be Ralphs for absolute yummy foods, beverages,best books & movies , health & beauty, mobile market, Bakery stuff and many more. Online pharmacy , digital coupons, fuel reward points , gift cards are also available in Ralphs. Shop online and order your choice. Amazing brands, comfortable prices, attractive discounts and many online here. Instant discounts on appliance and gadgets, vast varieties of Furniture,Computers,Mobiles are the special attractions. I feel proud to shop in Ralph's which made to get things within my budget.